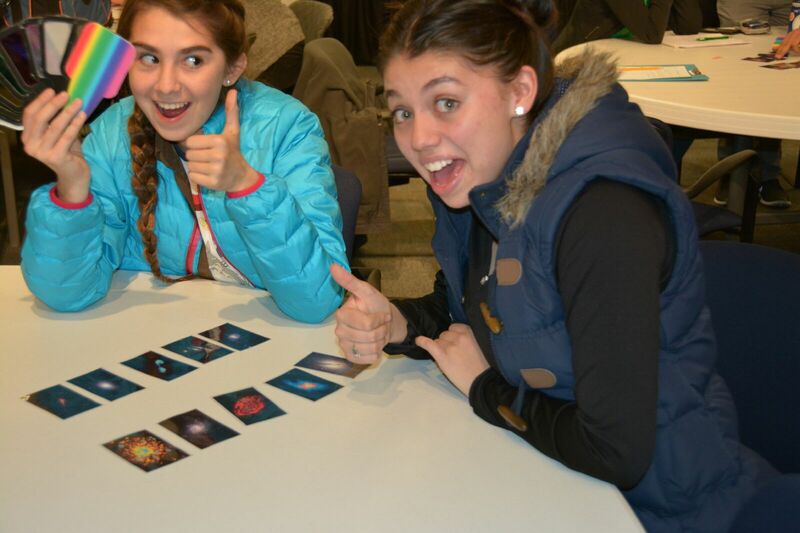 Teens try to match up images based on different types of radio waves. Dr.Lloyd Ronning started the presentation by introducing herself and her work and education background at college and at LANL. She then introduced the audience to the focus of the lecture, the discovery of gamma ray bursts. The story of gamma ray bursts started during the Cold War when both the United States and Russia signed an agreement not to test nuclear weapons. Los Alamos National Laboratories designed and constructed the Vela satellites that were designed to monitor for any nuclear testing. What they found was far more intriguing than nuclear explosions. Dr.Lloyd Ronning then asks the various table groups to come up with some ideas of what could be causing these mysterious bursts. All of the ideas are written on a whiteboard, and then interactively compared to some of the far fetched ideas hypothesized in the years after this discovery. Equally important is that our planet is an incredibly small cross section compared to the area of even our own galaxy, and we see gamma ray bursts up to a rate of one burst a day. This means that these gamma ray bursts are incredibly common. Dr.Lloyd Ronning demonstrates this by throwing chocolates at a fixed area target at multiple distances. 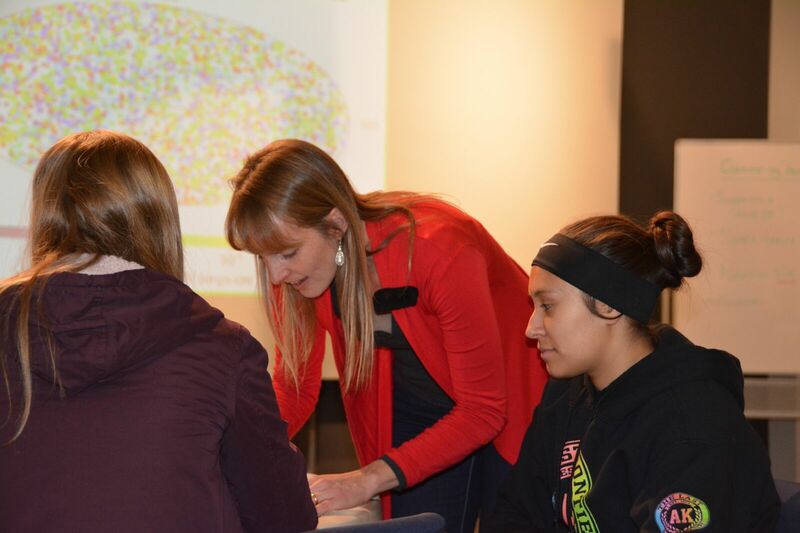 Nicole Lloyd-Ronning talks with teens about Gamma vs Radio waves. Decades later the source of the bursts was still a mystery. Newer satellites such as BATSE confirmed that the gamma ray bursts were coming from space uniformly in all directions at varying intensities and duration times were. The uniformity suggests that these phenomenon are not localized to our galaxy because our galaxy is a disk shape. In order to demonstrate the importance of looking at our universe in multiple frequencies of light, Dr.Lloyd Ronning passed around ten cards to each table, five of them are a picture of one object in five distinct frequencies of light, and the same for the other object. The five light frequencies shown in the pictures were radio, microwave, infrared, visible, x-ray, and gamma. The objective was to show how different things can look at different frequencies and how important that would be to identifying distance and energy types. The task was surprisingly difficult and insightful. Finally what pieced together the source of gamma ray bursts was by using the doppler shift of observed radiation afterglow to determine distance. All of these observations over a period of several decades finally showed that the source of the bursts are dying giant stars, and the energies emitted are truly astronomical, even on an astronomical scale. In order to show how this amazing story is relevant to modern research topics, Dr.Lloyd Ronning talked about areas of modern astronomy that have much the same mysteries about them as gamma ray bursts did to the astronomers of the late 19th century. An example of this are fast radio bursts.